For my first week in Italy, I documented a detailed explanation of my days, just to explain what life in Europe was like for a first timer. During the first week, there was an abnormally humid heatwave that passed through – I was lost, found gelato, and finally the weather mellowed out just long enough to wear pants for a day. Four flights, thirty hours, hardly any sleep, and arguably the equivalent of one meal to begin my adventure abroad. I flew from Los Angeles, to Miami, to Berlin, to Stuttgart, then finally arrived in Florence. I hailed a taxi and arrived at Hotel Tornabuoni Beacci, nestled between Prada, Celine, Salvatore Ferragamo, etc. The hotel was absolutely amazing. It had an elaborate, but typical Italian style which was perfect for breaking in my culturally diverse transition from America. There was a beautiful rooftop terrace that overlooked the city across the hall from my room with vines of ivy crawling up the walls. Every romantic Italian cliché was summed up into one humble hotel. After a much needed cold shower, I met with family friends for my first Italian meal. We met at Rivoire Café in the Piazza della Signoria, enjoyed some red wine, and happily feasted on spinach and ricotta filled ravioli. After a fantastic meal, we began exploring. We walked across the Ponte Vecchio and arrived at the Palazzo Pitti where we walked through the Giardino di Boboli (the palace gardens). 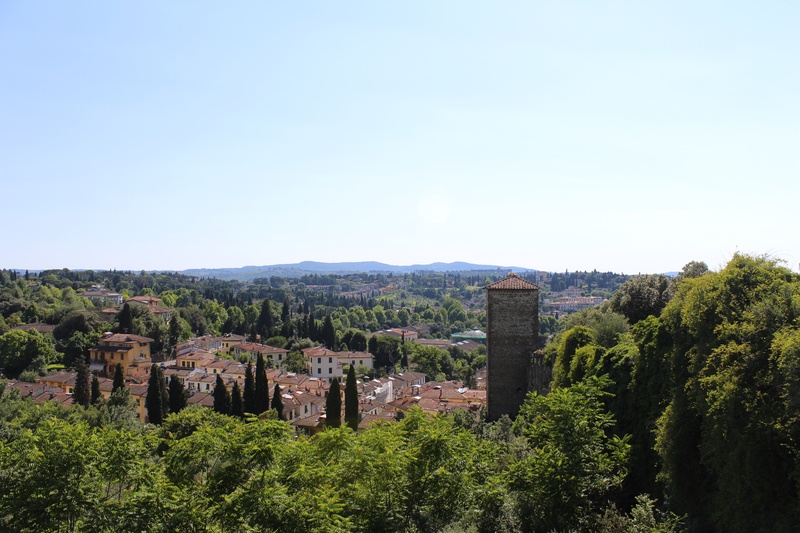 From there I was able to see some amazing views of Florence, I finally relaxed for the first time and soaked in my surroundings – it was then that I realized how lucky I was to be standing there. Afterwards, we continued walking through the city where I tried my first authentic gelato, I feel any additional commentary on this epic chocolate experience is fruitless (hehe puns) but really, it was unreal, I wish everyone on this planet could experience real gelato. After a quick nap, we met again at Il Latini (est. 1911), a famous restaurant in the heart of Florence. Il Latini is known for their amazing atmosphere and their perfectly prepared prosciutto. We began our extensive four course meal consisting of the freshest ingredients, flawlessly prepared dishes, and once again some delicious wine. After the perfect evening out, I crawled into bed and officially ended my first day in Florence. I gradually rolled out of bed and began my next day. The hotel computer system was down so I couldn’t check out, but the gentleman at the front desk just laughed and said “Well uhh, come back whenever you can ehhh.. you can pay whenever, today, tomorrow, whenever, hopefully the internet is better then.” I figured that was the perfect opportunity to leave my luggage and go explore before moving into my apartment. I eventually found my way to school and met a few other students from the program. We all went out to lunch together and shared our awkwardly awesome first-day foreigner stories. After finally checking out of my hotel, I called a taxi, and drove across town to my new home. Since elevators, clothing dryers, and many other amenities which we take for granted back home are considered a luxury in Italy, I carried my 70lbs of luggage up five flights of stairs to the top floor. Out of breath and drenched in sweat, I met my new roommates. We all went out for dinner in town and just relaxed for the rest of the night. In the early afternoon my roommates and I had orientation, we navigated our way across town, and promptly met our new classmates and professors. That evening, we all met for a welcome dinner at the Rubaconte Restaurant. Following dinner, my roommates and I strolled into town for some fashion week festivities. Throughout the week there were multiple private and public events honoring all of the new mens fall fashion lines… aka lot’s of great clothes, gorgeous people, and open bars. After enjoying a couple of cocktails (Aperol Spritz’ and Americano’s), we mingled with a few locals, and then went home for the evening. This was my second day of my Italian language course and my first day of my Food & Culture Class. Our first day in F&C consisted of a walking tour of the city, we spotted a few local restaurants and then found our way to La Carraia, the greatest gelato in town. Afterwards, I met again with my family friends for their last evening in Italy. We met at Colle Bereto Café, shared some Chardonnay, had some light appetizers, then walked around town. I showed them La Carraia, and again had to have another gelato. Following dessert, we went to Trattoria Gargani for dinner. We shared a bottle of a full bodied red wine accompanying homemade pesto pasta, I nibbled at their peppercorn filet mignon, and then shared a slice of cheesecake… so actually we shared a second slice of cheesecake and some dessert wine, because by this time all three of our waiters insisted we have more. After an absolutely wonderful evening we said our last goodbyes and I headed home. Accent (my study abroad center) hosted a walking tour to help familiarize the students with the area and to introduce some of the history behind this beautiful, ancient town. We split up to walk around with tour guides and together saw many amazing things. After the tour ended, I went home and enjoyed a much needed 4 hour nap. I then went to the Duomo to register for the 74th Annual St. John’s Evening Run, Notturna di San Giovanni. The marathon was unbelievable. People lined the streets to cheer, high-fived passing by runners, and shouted motivational chants. Everyone was smiling, waving, and together helped create one of the most amazing experiences of my summer.